HOA Collections LLC (HOA Collections), a Nevada Corporation and licensed Collection Agency, was formed exclusively to serve the foreclosure needs of Nevada investors, lending institutions, homeowner associations and association management companies. Privately owned and operated, HOA Collections, has built a solid reputation of professionalism, timeliness, attention to detail, and prompt liersonal service. There is an undisputed fact that “Third Party Involvement” resolves problems. Why use a do-it-yourself approach to your non-payment problems, when you can utilize the services of a highly trained staff of professionals to do the job for you, at no cost to you. As a licensed COLLECTION AGENCY, we maintain the highest standards of professionalism, are State Regulated, Bonded and Insured, and provide “peace of mind” for our clients. Like any other business, a Community Association is an ongoing enterprise which must maximize their revenue and minimize losses for the benefit of the homeowners. We provide Associations the most economical systematic approach. We utilize the non-judicial foreclosure process, because it is the most expedient and cost effective approach to recovery, avoiding protracted and expensive litigation in the courts. IT’S THIS SIMPLE: Any funds spent to collect on a debt potentially compounds the loss unless you have the right experts working for you. Our program is performance based, which means we get paid when you do. We offer friendly and personalized service, monthly reporting on all accounts, and we treat all homeowners with respect and consideration. We look for the most suitable resolution to problem. The key is to resolve the delinquency, recover the money, and save you time and money whenever possible. This may take the form of a payment plan. This is where we shine. The most important and rewarding aspect to collection is to give a homeowner an opportunity to bring their account current and become a productive paying member of the Association. Using respect and dignity, we assist the homeowner with an acceptable plan to bring their past due balance current while maintaining the payment of their current dues which increases, the Association’s “Bottom Line”. This area takes experience and finesse. Our trained staff does everything possible to find the most satisfactory resolution without waiving your rights. If a homeowner refuses to cooperate, a Foreclosure Sale may be warranted, if it makes sense to proceed in that direction. In any event, you need to know your options. We will present them to you and assist you in making the best decision possible on each particular case. Don’t waste money on unnecessary legal fees and costs. Don’t get billed on an hourly basis. Trust your foreclosure needs to HOA Collections, LLC and relax in the knowledge that the job will be done, done right, and in the shortest time possible. 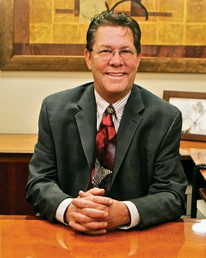 Mike Randolph formed HOA Collections LLC in June of 2000. Randolph manages and is responsible for the daily operations of HOA Collections, specializing in non-judicial foreclosure for Lenders and Homeowner Associations. Randolph's numbers speak for themselves; in the first six months the company recovered $138,000, the first full year recovery $914,000, second year recovery $1,453,000, third year recovery $1,653,000, forth year recovery $2,675,000 and has just continued to grow to over $4 million in 2010. Randolph started in the collections industry in 1990 at Transworld Systems, Inc. in Reno. In 1992 he was promoted to District Manager and in 1995 he was relocated and promoted to District Manager of the Las Vegas office where he went on to set new national records in collections, causing his promotion to Regional Manager, where he continued to set national collection records. His years of experience, dedication and commitment to exceptional service are the corner stones of his success with HOA Collections. Randolph is an active member of American Collectors Association, Community Associations Institute, CAMEO, The Better Business Bureau, and Las Vegas Chamber of Commerce. He provides free workshops in Collection Practices for board members, as well as Managers, Assistants, and Accounting departments. In his spare time he serves as a board member in his own community and enjoys working with teens in soccer and community service projects.